The Project: The LYJ-AAHS Project consists of a museum site with two buildings. The first building is an early 20th Century, one room African American school and has been relocated to the museum site and has been restored. The second building will be a 2050 sq. ft spacious gallery and meeting-listening room. The museum and history center site will be located on Ada Lois Sipuel Avenue. This street was named in honor of Ada Lois Sipuel who, in 1946, filed a lawsuit because she was denied admission to the University of Oklahoma School of Law. After the Supreme Court's favorable decision, Sipuel, the first African American was admitted. Purpose: The LYJ-AAHS Project will create a museum and history center that will be dedicated to the collection and exhibition of items pertaining to the heritage and culture of African Americans through the relocation and restoration of an early 20th Century one room school and by providing a Gallery of exhibits and various artifacts. This is to encourage the study and appreciation of the contributions of African Americans. Background: During research for a local television documentary, Loretta Y. Jackson founder, interviewed individuals who lived in small towns in Grady county with a population less than 650. 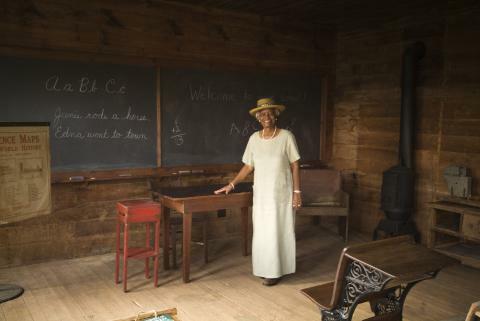 These interviews included African American individuals who, in the 1920s, attended this rural, one room school that she found still existing on a farm. This school is an important part of African American history and will represent the educational system for African American students in rural Oklahoma. Plans and Timeline: Through the efforts of an extraordinary group of local, state and national people, the following has been accomplished. A grant from the Oklahoma Department of Commerce provided for the moving of the one room school from the farm near Verden to its permanent location in Chickasha. A grant from the National Trust of Historic Preservation, through the establishment of the endowed Ruth and Allen Mayo Fund for Historic Preservation in Oklahoma, provided consultant services for architectural drawing for the complex and to restore the one room school. A grant from the National Trust of Historic Preservation made it possible to restore the roof on the one room school. The one room school was placed on the Oklahoma Register of Historic Places and the National Park Service placed the one room school (The Verden Separate School) on the Rational Register of Historic Places on December 16, 2005. The "African American Museum and One Room School Restoration Project" has been designated an Official Oklahoma Centennial Commemoration project funded in part through a grant made possible by the Oklahoma Legislature. Restoration of the one room school started November 7, 2006. The museum complex will follow as funds become available. Funding: The LYJ-AAHS Project cost is an estimated $300,000 to include: (1) restoration of the one room school and, (2) approximately 2050 sq. ft handicap accessible, museum facility which will include a lobby area, a spacious gallery, a meeting-listening room, restrooms and storage space. Floor plans are available for review. Asset To The Community: The LYJ-AAHS Museum project will be an asset to Chickasha, its community, the state and nation.On December 16, 2005, the Verden Separate School was placed on the Oklahoma Register of Historic Places and National Register of Historic Places. It will provide opportunities for local, state, national and international visitors to enjoy and learn from the diversity of people who helped settle Grady County and Oklahoma.